Any author who attests that “birdwatching is the real national pastime,” American or otherwise, deserves attention. Jonathan Rosen, in actually making a compelling case for his electrifying assertion, demands respect. Too many books in the birding genre focus naturally on the innumerable hows of technique, craft, and field ornithology. Rosen’s mighty The Life of the Skies takes on the more formidable question of why. 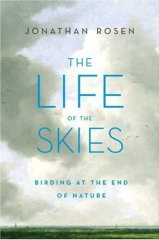 The Life of the Skies: Birding at the End of Nature astonishes instantly with a scope that draws together disparate threads from the arts and sciences to weave a sophisticated understanding of birdwatching’s allure. Fantastic from the very first page, Rosen begins this book by trying to articulate the ineffable. Tackling the nature of biophilia in a prologue that presages the wonders to come, he concludes with a disclaimer that The Life of the Skies “offers no grand synthesis,” then proceeds to do exactly that. The chapters that follow, each one independent but employed in concert to a lofty cause, offer an erudite, contemplative analysis of the philosophical underpinnings of modern birdwatching. Drawing a line from birding icons like Audubon and Peterson to men of science like Darwin and Wallace to esteemed poets (Thoreau, Whitman, Frost, and Dickinson) and politicians (Teddy Roosevelt, naturally) alike, Rosen unearths the archetypal architecture on which modern birding rests, the bedrock foundation of an avocation that appears to be growing at last in both understanding and interest. Cerebral and sophisticated, The Life of the Skies asks a fair share of thought-provoking questions but follows up time and time again with fresh insights and answers. While this book immediately vaulted to the top of my personal favorites on the subject, it is hardly flawless. The first half moves with much greater momentum and inspiration than the second, somewhat plodding portion. Rosen’s professional experience provides him both context and confidence to examine matters of faith through birding’s lens, but he still seems more sure-footed on the subjects of history, literature, and science. Or maybe it’s that I am. Either way, The Life of the Skies: Birding at the End of Nature must be considered an essential read whether you’ve already recognized your interest in birdwatching or have yet to discover it. I recommend it highly, further suggesting that it be read when one is in a mindset most receptive to introspection on the nature of avian observation, preferably on a plane en route to some exotic birding adventure! You nailed it. That’s pretty much exactly the way I feel about this book as well. It’s informative, entertaining, well-written, and thought-provoking. The buzz about this book is so exciting. I can’t wait to read it. Thanks for a fine review. Thanks, Grant, and great review as well! Julie, I know you’ll love it. It’s a shame you’ve already purchased your copy because we’ll be giving a few copies away very soon. A lifelong avid birder and amateur ornithologist (and trained scientist), when I picked up this book I looked forward to reading it– anticipating sharing the insights of a kindred soul. The book did prove to be a well-written and interesting personal memoir, with an often fascinating consideration of the way birding can drawn one into exploration of fields one wouldn’t have dreamed were relevant either to birding or to one’s own perception of human relationship to the rest of the natural world. However, I was often disappointed at Rosen’s failure to look at or follow through on some of those issues, instead treating them as givens. For him they may be: for me, they are not, and his assumptions make it difficult for me, a woman, to identify with his journey of exploration. They effectively exclude me from his found community of birders. Overall, I found the book ethnocentric, often making assumptions about the history of both birding and the people who bird. Rosen made this choice to provide a reasonable scopt for his book. That is reasonable. Unfortunately, he limited even this scope by reverting to some cultural stereotypes that he seems to neither recognize or question. His unfortunate reliance on E.O. Wilson shapes far too many of his perceptions and assumptions. Wilson, a man I myself admire for many of his contributions to science and philosophy, nonetheless had a disproportionate– and damaging– influence on the perspectives of people understandably eager to get beyond the equally misguided Freudian influence, through his unbending stand of “sociobiology”. Wilson, and Rosen, failed to follow through on the considerable body of research that demonstrates that genetic influence is both much more intrinsically flexible and more complex than Wilson believed. And Rosen in his discussion failed to consider (or even acknowledge) the massive influence of cultural conditioning, a strong componant in development, both human and nonhuman, in his discussion. Yes, he makes disclaimers, but those were throw-aways: he fails to explore them in his discussion. This would be fair, if Rosen had written only a memoir. But it is a memoir that serves as a scaffolding to weave together personal experience with a discussion of history, philosophy, and science. Given that, I think the author should have recognized a responsibility to identify the unknowns, or the fact that one chooses one way of defining the influence of some factors over others. Too bad. It could have been a much better book.